The big Marvel Universe melee of the 1980s could be coming to a videogame sometime in the future. One of the next Marvel Comics videogames might feature a mass of heroes and villains in a fight to the finish. Marvel has filed a videogame trademark for Secret Wars, a storyline conceived in the 1980s that featured just about every prominent character in the Marvel Universe. In Secret Wars, a 12-issue crossover series, the powerful Beyonder brings a wide variety of Marvel heroes and villains to his Battleworld and directs them to beat each other up to gain their hearts' desires. Heroes featured include Spider-Man, Hulk, Spider-Woman, Captain America, Iron Man, the Fantastic Four, and the X-Men (Cyclops, Wolverine, Colossus, Storm, Professor X, Rogue, Nightcrawler). Some of the villains brought to Battleworld were Doctor Doom, Ultron, Galactus, Doctor Octopus, Lizard, Molecule Man, Enchantress, and Kang the Conqueror. Marvel's trademark filing includes everything from videogame cartridges and discs to downloadable games and virtual reality. It also includes bicycle helmets and sunglasses. The trademark doesn't give a specific idea of what Marvel plans to create, and only shows that the idea is there, but it's not hard to predict the possibilities. The Marvel Ultimate Alliance series could easily focus on a storyline like Secret Wars. The last release, Marvel Ultimate Alliance 2, focused on Marvel's Civil War in which Iron Man mandated that superheros divulge their secret identities lest they face criminal charges. Secret Wars did have a few similarly significant events associated with it, such as Spider-Man's discovery of the black alien symbiote costume that later became Venom. The Secret Wars trademark could also refer to something aimed more at kids, similar to the Marvel Super Hero Squad: The Infinity Gauntlet spin-off, which actually seems most likely to me. Another idea that seems to fit is a fighting game followup to Marvel Nemesis: Rise of the Imperfects. 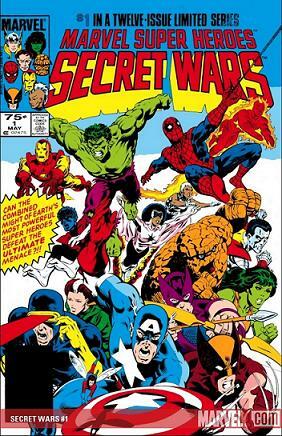 Whatever it is, prepare for a Marvel royal rumble if a Secret Wars game ever makes it through production.